Hello you guys! How is your day? I'm relaxing at home after a trip to Dublin and watching some Instagram stories. Today, I'm coming to you with a dupes post. Yes, I found a pretty good dupe recently and I wanted to share it with you. By the way, I'm thinking of recording some makeup Youtube videos soon. What do you guys think? Is it a good idea? Let me know in the comments! For now, let's get on with the DUPES! Brows are all the craze right now. Hairy, full, feathery or natural - we all have our own style. I, personally, have two haha. Number one is for every day wear and this is the one I'm going to show you today. Benefit 'Gimme Brow' on my eyebrows. Let me introduce you to the first product which is the Benefit 'Gimme Brow' Brow Gel. This product is a classic. Everyone and their mother used it at least once. And now, the 'Gimme Brow' along with many other products from Benefit has a new revamped packaging and let me tell you... it's gorgeous. I also have my eye on the Ka-Brow but unfortunately it's a pretty penny :( The 'Gimme Brow' costs €26 for 3g of product and it is available in Debenhams, Brown Thomas and selected Boots stores. 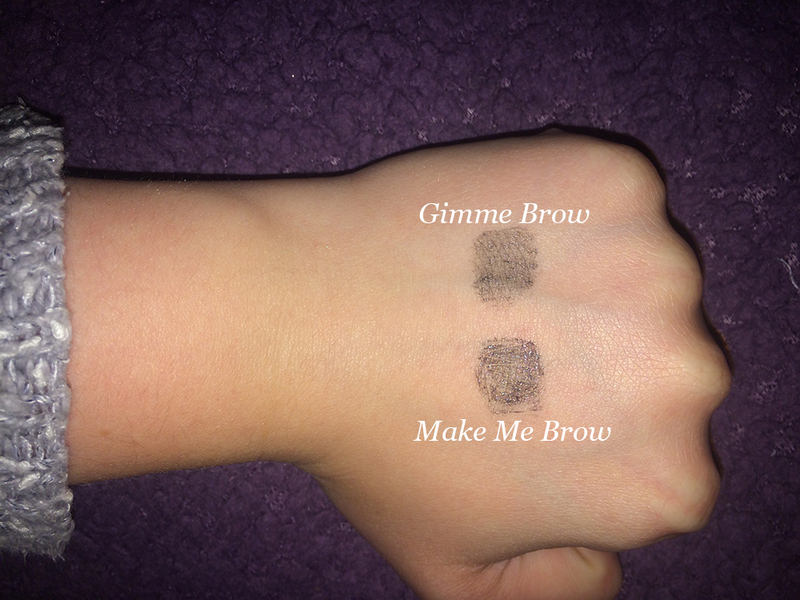 I have the mini 'Gimme Brow' which has 1g of product and I have it in the shade 5. And now to the cheaper dupe... please welcome Essence 'Make Me Brow'. When I first saw this product I knew I had to have it. The Essence packaging is so similar to the old 'Gimme Brow' packaging. You can get Essence in a lot of pharmacies, but I get my Essence products in Penneys. The 'Make Me Brow' costs €3.10 and has 3.8g of product. I have mine in the shade 02 Browny Brows. It is no secret that I feel that this product is definitely a dupe, however there are little differences that make the Benefit 'Gimme Brow' a tad bit better. The brush of the 'Gimme Brow' is much softer and has a slightly different wand. This one gets smaller towards the tip, which makes application of the product a tiny bit better. Secondly, I think that the 'Gimme Brow' gives a softer, more natural finish. However, the fibres are more visible in the 'Make Me Brow' which proves that you get more colour pay off in the cheaper alternative. Lastly, the price. I would much prefer to spend a little over €3 to get virtually the same result.